An Interviewee Slings Mud In A Live Interview : NPR Public Editor An online article provides the balancing perspective to a radio attack. Former Florida Gov. 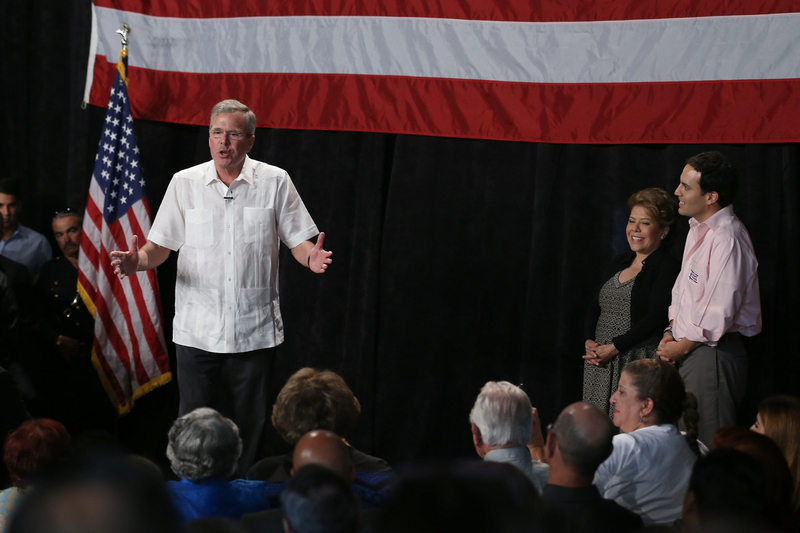 and Republican presidential candidate Jeb Bush speaks to supporters as wife and son look on during a reception thrown by the Right to Rise SuperPAC, prior to announcing his candidacy. 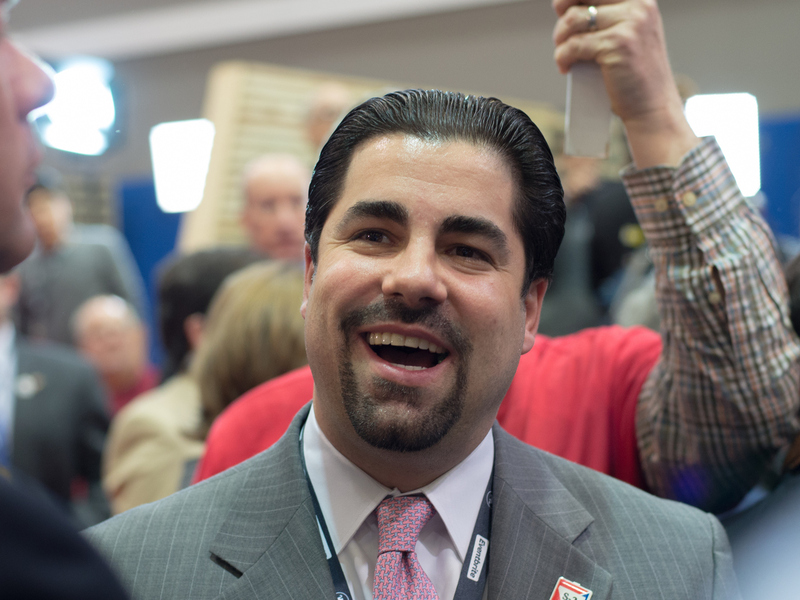 Danny Diaz, campaign manager for former Republican presidential candidate Governor Jeb Bush, speaks to reporters in the spin room after the New Hampshire Republican presidential primary debate. An addendum of sorts to last week's column on NPR's move to add more live interviews to its newsmagazines: Sometimes that makes for messy journalism. Steve Inskeep's Tuesday Morning Edition interview with Jamie Wareham, a top fundraiser for Republican presidential candidate Jeb Bush, was refreshingly honest. On the record and off the cuff, Wareham — who, as NPR reported, helped raise millions of dollars for the Right to Rise superPAC supporting Bush — flung colorful insults at other Republican candidates, and minced no words placing blame for the failure of the Bush candidacy. INSKEEP: So you think the campaign was run the wrong way. Is it because the campaign did not adapt to the political environment that turned out to exist in 2016? WAREHAM: Yes and no. We had, you know, a campaign manager who had no real experience. INSKEEP: Danny Diaz is the person. INSKEEP: And we should be fair, he had a lot of experience, but not in this particular role. WAREHAM: Correct. His major accomplishment prior to being hired was losing the Ken Cuccinelli campaign in Virginia. So he had no successful experience, but he did have experience. Inskeep appropriately pushed back, but what I kept listening for was a Diaz response, or at least an acknowledgement that NPR had reached out to Diaz for a response. But that didn't happen. It turns out that the interview was live. (Inskeep said at the beginning that Wareham was in the studio, but interviews are often pre-taped there. Also, Wareham did say, "Good morning," a subtle cue easily missed — I came into the interview late and did not hear that.) "We didn't know he was going to name Diaz," Morning Edition's executive producer, Sarah Gilbert, told me. After the interview, the Washington desk reached out to Diaz for a follow-up interview for the morning show, and he declined, Gilbert said. Instead, NPR by mid-afternoon updated an online-only article, originally a deep-dive into how the Bush superPAC money was spent, with extensive information about Diaz's past work. It noted, "Diaz, a veteran hand of four presidential campaigns and a former Republican National Committee communications director, certainly has more experience than one failed race. Though he's never run a presidential campaign, and only a few have run successful ones, he helped elect Republican Govs. Doug Ducey of Arizona and Susana Martinez of New Mexico. He also became known as a 'fixer' on Senate campaigns, helping elect Sen. Mark Kirk of Illinois." Republican colleagues are quoted defending Diaz, as well. The lengthy article opens with the words, "It's never clear what the truth is when a campaign ends, but it gets ugly." Indeed, the article quotes an anonymous "former campaign operative familiar with the situation" who accuses Wareham of "having an ax to grind" (and more). Wareham was given a chance to respond — which he did, again colorfully — but the anonymous attack goes against NPR's guidelines. "After the Morning Edition interview aired, I felt it was important to get a response from the people who were involved in the Bush campaign who would certainly know more about this than me and worked with Diaz. As I wrote at the top of the piece, it's hard to know what the truth is when a campaign ends, and there's often a lot of infighting. I don't like having to report these kinds of stories in general, and I don't love using unnamed sources, but sometimes it's the only way to get people to be more frank with you and get closer to the reality of what actually went on. That's especially true in the political world, when most of these folks are protecting reputations and have to, in many instances, work with each other again. Because Mr. Wareham made such a strong criticism of the campaign manager on our most-listened-to platform, I pushed to get an on-the-record response from campaign officials, including Mr. Diaz. They declined. What's included is the best level of specificity in attribution I could get from someone familiar with the situation. When the former Bush campaign operative made a specific, pointed charge back, we wanted to get Mr. Wareham's response, but getting another response from the campaign to that charge seemed like it would have been overkill — keeping a food fight going. I wanted to give balance and a nuanced view as to what actually went on and what the ACTUAL seeds of the on-air criticism were to better inform our audience. Had I not included the unnamed source quote, which again I worked up to the highest level of specificity I could, we would not have been informing our audience fully. All we would have had was an on-air charge that wasn't fully answered, as well as two on-the-record quotes on how other respected campaign veterans viewed Mr. Diaz's handling of the job. That wouldn't have taken our audience more inside the campaign." Overall, the pair of pieces provided terrific insights into the messy world of campaign finance and campaign politics. I hope NPR will do more such reports. I wish NPR had not used the anonymous quote; often more digging can turn up someone who will go on the record. But if speed was of the essence and the quote was the only alternative to letting the Morning Edition charges go unanswered for much longer, then I understand the tradeoff, even if I don't like it. One other thought. Listeners already write me every day with concerns if they hear only one perspective on a story in a piece; many would prefer that each and every story contain multiple perspectives. It's not always practical or possible, particularly with live interviews, as the Morning Edition piece shows. Nor would it necessarily make for compelling listening. But as my predecessors have also argued, NPR could at a minimum do more to point listeners and readers to the alternative perspectives found elsewhere on NPR.org; the listener and reader might be better served if, say, the online archive of the original Morning Edition piece included an editor's note at the end clearly pointing readers to the online follow up as a specific rebuttal to Wareham.